Konami knows that it has a lot to prove with its Pro Evolution Soccer series. After being usurped by Electronic Arts' FIFA brand, the Japanese-developed football experience – which was once deemed the definitive simulation - seemed to quietly fade in the back of gamers' minds. 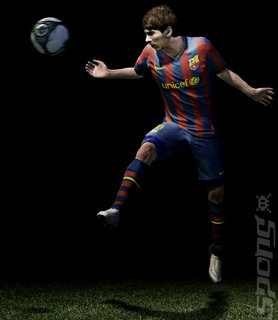 With PES 2011, the team has made its boldest statement yet. Practically everything in the series' engine has been torn down and rebuilt from scratch, maintaining only a sliver of the code's backbone as a base to jump off from. Dramatic changes and renovation certainly seems like a good idea for a series that has been seen to stagnate in recent years. The first sign of this change can be found in otherwise mundane things such as menus and squad formations. Specifically for the latter, one can move a pointer around the pitch using the left stick and press a button to select a player – dragging your chosen number to anywhere on the pitch that you deem appropriate. Coloured 'zones' appear to offer some advice on where best to place a player, while a number of recommended substitutes become highlighted on the side of the screen. Playing an exhibition match or two provided the biggest insight into the changes made under the hood, however – control of your player is very fluid, with basic tricks and challenges for ball possession now integrated into the left stick. Once you get the ball, it's all up to your timing and rhythm - when the formation pushes forward, it takes a certain amount of time for fellow players to come up and become available for support. Smashing the pass button won't do any good either, because your players may fluff up and panic – add the fact that you have to be quite precise with your passing aim using the left stick, and you realise that you can't simply glide the ball backwards and forwards to dupe the computer AI. The AI has been heightened too, so rival players appear to act very spontaneously – it can make mistakes, just like you, but it won't hesitate to challenge you right away if you gain possession. The key elements to success when it comes to offence is – as any football nut would expect – the ability to think about three steps ahead, understand where your fellow men will end up at each step, and aim your passes accurately enough for them to collect. More advanced tricks can be achieved using flicks of the right stick, but if you don't allow for timing and space then you can quickly become scuppered. It's not uncommon to see four or five opposing players try to box your lone player in, so having a hero isn't exactly recommended either. Overhauls are perhaps most easily spotted by simply taking a look at the improved graphics, the impressive player animations and the game's HUD (or lack thereof – besides the name above each player, his stamina bar just underneath it and the usual score ticker, screen real estate is dedicated to the game in progress). Pitch and lighting effects are great, and offer an element of atmosphere arguably missing from PES 2010. The revised menu screens display a huge array of game modes – including the UEFA Champions League, Copa Santander Libertadores, the PES Master League (where you get to create your own dream football club) and Become A Legend (create a player, hire a manager, sign a contract, train your abilities) - but inside certain modes the horizontal XMB-esque interface can get a little bit confusing. If all you want to do is jump into a match though, the top menus couldn't be easier to navigate. 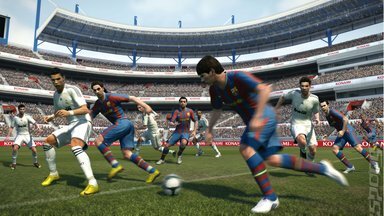 PES 2011 is certainly shaping up to be the most important entry to the series in several years – Konami is actively trying to address concerns with the most recent titles, and it really feels like the team has had a boot up its arse to better compete with FIFA. The only concern is whether, despite all of this exhaustive effort, PES 2011 will be good enough to show FIFA converts that it has all the right ingredients necessary to warrant their attention. If nothing else, it plays like a very different game – whether that makes it better is a question better saved for its October release date.